Several months of intense physical training will result in the ultimate test of endurance on Sunday, Jan. 27, as more than 20,000 runners compete in the Fitbit Miami Marathon and Half Marathon. Without proper conditioning and preparation, finishing a 13.1 or 26.2 mile course can take its toll on the mind and body. But by the 6 a.m. start of the event, most participants have already experienced the highs and lows of long-distance running after grueling periods of training. By now, they should have learned how to cope with the accompanying challenges of achieving proper hydration, nutrition and injury-free regiments. Many newbie long-distance runners have trained with more experienced marathoners belonging to the many local running clubs that gear up months in advance for the big January event. Proper physical and mental preparation is a must on event day, says Michael Swartzon, M.D., primary care and sports medicine physician with Miami Orthopedics & Sports Medicine Institute. He is also medical director of this year’s Fitbit Miami Marathon and Half Marathon. Baptist Health South Florida is a sponsor and the official medical provider for the event, providing assistance at the various first-aid and medical stations along the full course. Runners will experience physical strains or injuries from overuse or lack of conditioning on event day, even if they have completed months of training that resulted in successful long weekend runs of about 20 miles for the full marathoners, and 10 miles for half-marathoners. However, most injuries on marathon day tend to be minor. Many runners simply underestimate the need for regular hydration with water or sports drinks that refill the body’s “electrolytes.” Common electrolytes include sodium, potassium and calcium.They regulate nerve and muscle function, hydrate the body, balance blood acidity and pressure, and help rebuild damaged tissue — all essential functions for endurance athletes. Those who are occasional runners and are considering taking part in a long-distance event should consult with their doctor to make sure they are no underlying health issues that could surface with the strains of training. For those experienced runners who have trained for the big event, it’s important not to introduce anything new to their routine on race morning, says Frankie Ruiz, chief running officer for Life Time Fitness and co-founder of the Miami Marathon. They are referred to as the “terrible too’s” — doing too much, too soon and too fast. The body requires time, rest and proper nutrition to reach the level required for long-duration events such as marathons. Muscles and joints need to recover throughout a typical six-month training program for a marathon. Most running injuries, commonly involving knees, the feet, the Achilles heel or the hamstring, don’t appear suddenly. They usually provide slow-developing warning signs that should not be ignored. Normally, these red flags include aches, soreness or a persistent pain. It’s up to each runner to heed the signs and see a doctor before serious injury develops. If signs persist after proper rest and ice/heat treatments, a physician may recommend physical therapy. Don’t underestimate the importance of the proper running shoes, especially for marathoners. An estimated 15 percent to 20 percent of running injuries involve the feet. Plantar fasciitis, small tears or inflammation of the tendons and ligaments from heel to toes, is usually the No. 1 foot complaint among runners. Those runners with very high or very low arches are more vulnerable, so the properly-fitted running shoes are vital for distance athletes. Detailed workout logs and periodic goals can keep you from those overuse injuries. Keeping a journal of how you did and how you felt during your long training runs can help you determine if a trip to the doctor is necessary. For example, you may notice during one weekend run that your knees started aching. If the ache worsens, you then have a precise record to share with your doctor regarding the start and duration of the pain. Monitoring progress and setting realistic goals are important tools for keeping the proper training pace and avoiding common injuries. 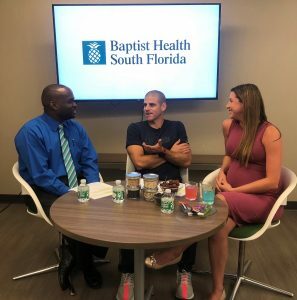 The Baptist Health News Team hears from dietitian Carla Duenas; sports medicine outreach coordinator Rob Henry; and marathon organizer Frankie Ruiz during a Facebook Live session about prepping for the upcoming marathon and half-marathon..